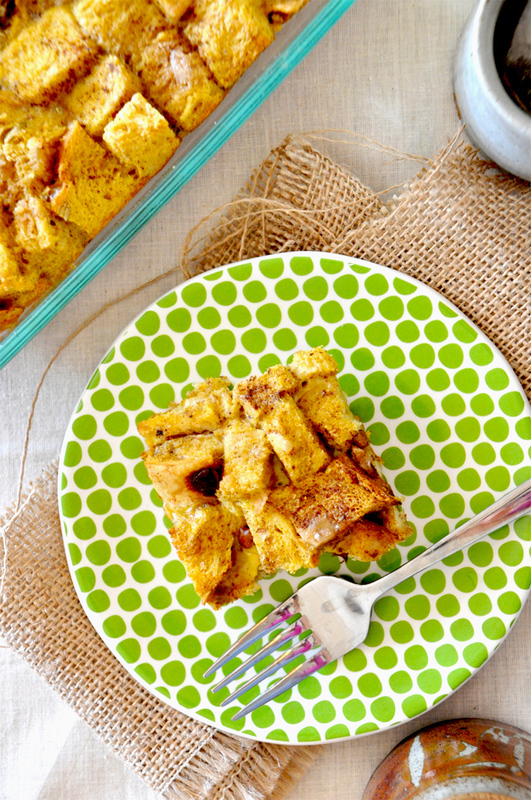 Pumpkin french toast = breakfast of champions. Take my word. Remember my 7-ingredient muesli bread? 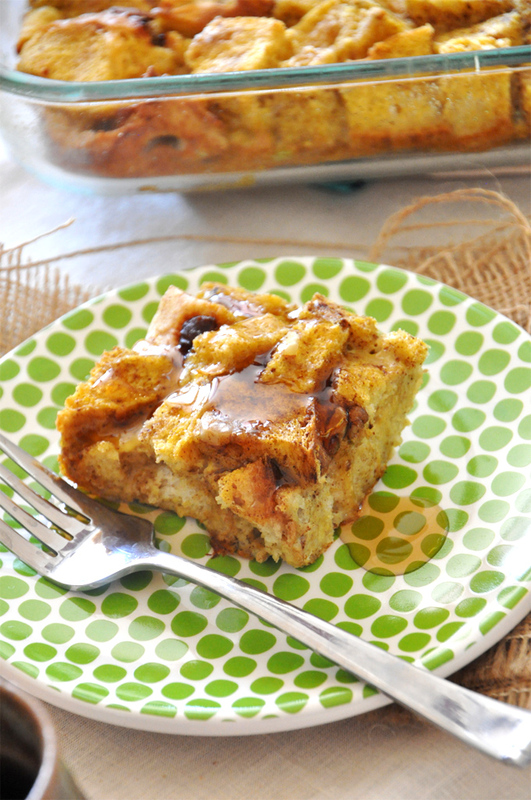 Well, it’s making another appearance in this pumpkin french toast. 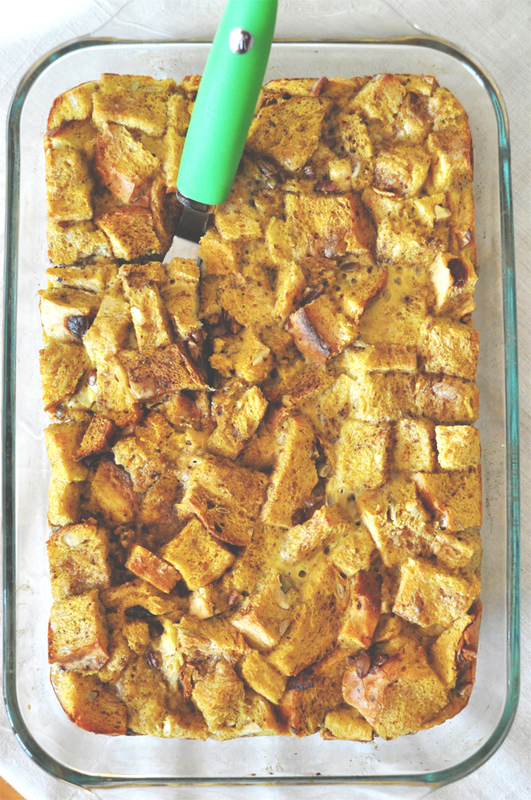 Chopped up into cubes, it makes the perfect base for a very fall breakfast. I’ve always made french toast the traditional route: dip bread into egg batter and fry right when you’re ready to eat. But, making it the day before and baking in the morning is actually a lot easier. Plus, it doesn’t require a griddle and allows the bread plenty of time to soak up the pumpkin-y goodness. The ‘batter’ consisted of several free range eggs, a healthy dash of milk, a scoop of pumpkin butter and plenty of pumpkin pie spice. Topped with brown sugar and it was good to go. You guys, it’s possible that I’ve never been so excited to hop up out of bed on a Saturday to preheat my oven. The anticipation nearly stole precious hours of sleep, but it was so, so worth it. As you can see, it turned out phenomenal. The crusty, raisin-dotted bread soaked up the batter and yielded a custard-like french toast bake that smelled like heaven in the oven. Topped with a little maple syrup (agave or honey) and it’s phenomenal. Not to mention it could feed your entire family and most of your neighbors. I ended up driving mine around to several friends and sharing a healthy portion. Now they think I’m the “french toast fairy” – not sure that’s a reputation I’m willing – or able – to keep up. Either way, it was fun while it lasted. If there’s just two of you dining on this breakfast, simply cut the recipe in half or even one-fourth for a more appropriate serving size. Either way, this recipe should be on your fall bucket list. I’m so glad I’ve already crossed it off of mine. In the morning, preheat oven to 350 degrees F (176 C), uncover and top with brown sugar, additional pumpkin pie spice and nuts (optional). Bake for 35-45 minutes or until golden brown and no longer wet. *For the bread cubes, just use as much bread as it takes to fill the bottom of your dish generously, plus up about 1 to 1.5 inches. If you've added too much to soak up the liquid, just remove some. And if it looks too wet, add some more bread. *I used 2%, but use skim or low-fat for a lighter recipe. Alternatively, use non-dairy such as soy or almond. *I HIGHLY recommend using pumpkin butter, as it has a concentrated pumpkin flavor and is much sweeter than puree. But if using puree instead of butter, it's important to compensate the flavor by adding a bit more puree, pumpkin pie spice, and a little agave nectar, brown sugar or maple syrup to the batter. Otherwise, it will lack that delicious fall, pumpkin flavor you're going for. * Some commenters have tried this recipe and varied the amount of pumpkin butter or bread they used for a better result. Because different breads can have different levels of sponginess and the pumpkin butter can vary in taste if it’s store bought or homemade, play with this recipe and make it your own! If you need more bread cubes, add more. And do the same with pumpkin butter. Please let me know if you have any questions in the process as I’d be glad to help! This looks spectacular…I wanna eat my screen! One question: every time I make baked french toast and follow the recipe guidelines, it seems like it becomes to “eggy” with baked egg making up the bottom and other sides of the french toast, which I don’t like. And this recipe calls for 7 eggs. What am I doing wrong, please help! It sounds like you may be soaking your bread in the mixture for too long, Wes! Try soaking it for less time and you should have better success. I love this recipe. I have made it multiple times for my parents and four siblings as well as my classmates at school. 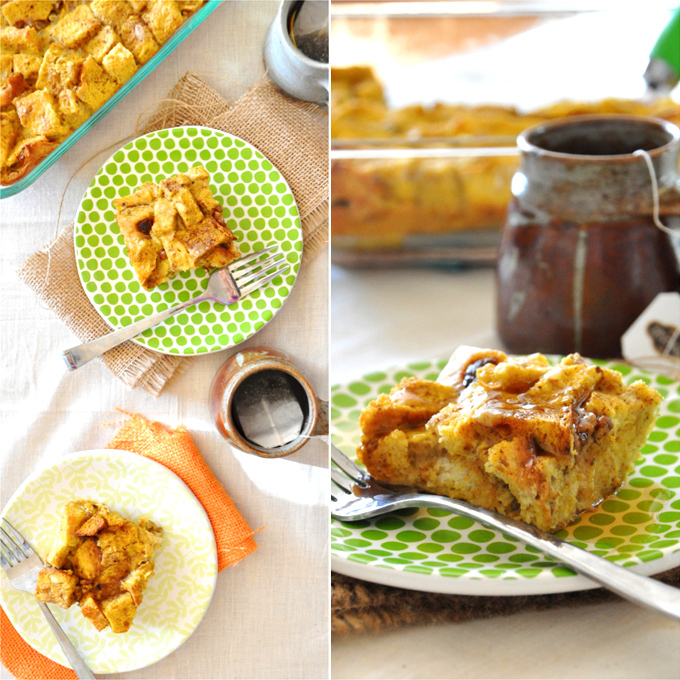 Anything with pumpkin is so tasty, and this has been one of my go to breakfast recipes. It never disappoints! Thanks so much for the recipe. This is our go-to recipe when we have people over for breakfast – the only sub we make is to use apple butter instead of pumpkin butter, which could help a lot of reviewers here who had trouble finding pumpkin butter. Also we sometimes use raisin bread – YUM. Thanks for the great recipe – so many of these french toast bakes add so much sugar and cream – this recipe is proof that you don’t need that!! Hi, I made this for a post-Thanksgiving breakfast because we had lots of leftover parkerhouse rolls and leftover pumpkin pie. So instead of the pumpkin butter, I used the inside filling of the pumpkin pie (about equal to half cup). I used 7 rolls, dinner roll size chopped into 8ths. Everything else I followed exactly. It was amazing! Very good with candied pecans, chocolate shavings and a dollop of vanilla yogurt. Thanks! I LOVE this recipe. I made it using Udi’s gluten free bread, almond milk, and the pumpkin puree. It is so so good!! I make it every year now around the holidays. Is it possible to make this vegan? Used a combination of pumpkin swirl and cinnamon swirl bread for added flavor, and it turned out so flavorful! Will definitely add this to the rotation and will make for visitors on a lazy weekend. So easy, so decadent! Thanks for sharing! Where do u get pumpkin butter? Don’t lol but I never had it? Followed the recipe, let it soak overnight etc. Flavor was great, but it takes a LOT longer than 45 minutes to bake. At 50 minutes it was still quite soggy in the middle. Mine took about 1.5 hours. Both my internal temp gauges verified my oven was at 350. This was great. Based on some other reviews, I did almost double the amount of pumpkin butter and pie spice, and would do that again. It was light and fluffy. Yum! I make overnight French toast all the time and one thing I have found it is it better to use day old French bread instead of just bread slices.. That may be why some are saying it is sloppy or has raw egg.. or maybe it tastes eggy.. I use 2 loafs.. cut crust off and then into squares.. The French bread cut into smaller pieces seems to soak up a lot of the mixture. My recipe also calls for 12 eggs and 2 cups milk.. I am sure that also makes a difference.. I bake it covered with foil for 30 minutes and uncovered 30 minutes.. Perfect every time!! I am concerned that the top will be too dry for my tastes, do you think this would work if you baked it with aluminum foil covering it to keep the top moist? If so, are there any other changes that would need to be made? Made the pumpkin purée with brown sugar version using pumpkin streusel breakfast bread from Target. Sooooooo delish! Everybody was asking for the recipe! Two thumbs up minimalist baker!! Delicious! Absolutely the best breakfast ever! It turned out perfect! Wonderful! Thanks for sharing, Cat! I am making this now. I didn’t have pumpkin butter so I used some canned pumpkin instead. I added sugar and a bit more vanilla. I will let you know tomorrow how it turned out. Made this last night and cooked this morning. My family really enjoyed it! I only made a half recipe, since there are only three of us. I used Texas toast (leftover from my daughter’s special PSAT breakfast request last week…don’t know if I would have tried it otherwise). I added a tablespoon of sugar, and used about a teaspoon of Pumpkin Pie spice. Making a half recipe, I adjusted the bread to fit my dish and used four eggs. I cooked it for 40 minutes at 350 degrees. I’m really glad I came across this on Pinterest. I’m not much for making special things for breakfast, it was a treat. Thank you. Looks awesome. I wonder if a cast iron skillet would work well here. I just found your receipt for the pumpkin butter! I’ll get it made today!! Where do you get or how do you make pumpkin butter? This French toast looks wonderful and I can’t wait to try it!!! I have a vegan french toast in our print cookbook coming out soon! Stay tuned!! I’m making this now! A few things that I did differently: I used challah bread because it’s personally my favorite bread to use for French toast – I think it will work well since the outer crust is quite firm (almost like a soft pretzel-texture) and the inside is quite fluffy and sweet. I used extra pumpkin puree and extra pumpkin pie spices since I noticed some comments saying that the pumpkin flavor wasn’t very strong with the original recipe. Unfortunately I didn’t catch the detail about overnight preparation and I am making it for a particular occasion, but I did have a few hours to let it sit and soak. If all goes well, I may make this again with pumpkin eggnog as a partial milk substitute. Thanks for sharing, Mary! Hope you loved it!! The pumpkin eggnog sounds like a great idea!!!!!! Any suggestions for an egg free version? Seven eggs is a lot to ask of my usual flax egg replacement. Oh Lord help me ! The smell when you walk in my kitchen is ahhhhhh! REMINDER: Must leave some for others !! ha! So glad you enjoyed this, Brigitte! Thanks for sharing! hi – Planning to make this dish soon. can you pls share the contents of the pumpkin pie spice since we do not get it here in India. Best french toast recipe ever!, I made something similar yesterday. ADD more pumpkin butter AND pumpkin pie spice to recipe! I used crusty italian (big loaf) bread. I came across this recipe and was super delights. I made my first batch for my son’s teachers for their last day of school last week. I found a separate recipe to make homemade pumpkin butter (orange juice, brown sugar, pumpkin puree, etc), which I made and used for this recipe. 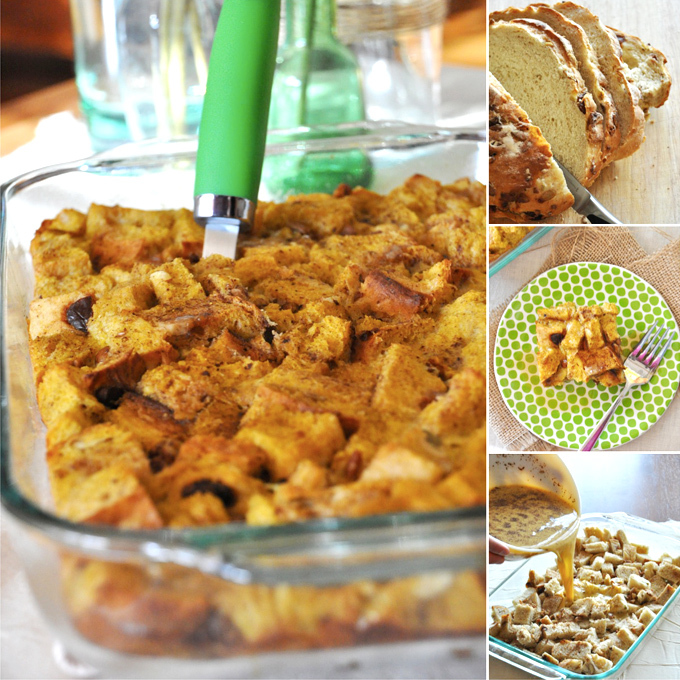 When making the first batch of this pumpkin french toast, I found the flavor not pumpkin enough …. actually, i didn’t taste much of any pumpkin in the liquid before I poured over the bread. So, I added a bit more pumpkin butter but still not a whole lot of BAM… pumpkin. I went ahead with it just in case the flavor came out overnight with soaking and the added pumpkin spice just before baking. I think it still needed more. In comes batch #2 a couple of days later for home. I added a total of 3/4 – 1 cup (not 1/4 cup) of pumpkin butter and 2 tsp (not 1 1/2 tsp) of pumpkin pie spice into the liquid mixture. I sprinkled a good amount of pumpkin pie spice on the top the next morning just before baking. Those tweaks did the trick… I got the pumpkin flavor I wanted…. I can tell it’s pumpkin now. Hi. Do you think this recipe would work in the slow cooker? This recipe is delicious! It was the perfect Christmas morning breakfast! I was a little nervous about attempting to let it sit over night (because of the gf bread).. So we made it the morning of and let it soak in the fridge for only 30 mins. We then baked it as advised but started checking on it around the 25 min mark because gf just doesn’t cook the same way… We prob pulled it out somewhere between the 30-35 min mark and it was nice and toasted on top and custardy inside. We found the recipe easy to follow and easy to make slight preference adjustments. This recipe is a keeper and just may become a christmas tradition. Thank you! Just made this for the first time for Christmas Morning for a tough crowd – my kids. It was quite a success with my daughter (10 y.0.) not my son (7 y.o. – he is tougher by far with different food options). I enjoyed it! I read all the reviews and made changes as necessary. – I used cinnamon raison bagels (about 4-5) I had left over in the freezer, they held up well to the liquid mixture and I fluffed up a little. I used pumpkin puree and added the pumpkin pie spice and maple syrup to the liquid and shook some on top before baking – it was good but I would have liked even more pumpkin – minor adjustment for next time. It was crispy on top and not soggy on the inside – baked for 30 min and added an extra 6-8 minutes after I checked it, not sure it needed it but it wasn’t dry. Only 4 stars because of the adjustments and the need for even more pumpkin flavor. Definitely need a bread that can absorb the liquid or cut back. Also, made it the night before, stirred it all and added brown sugar, pumpkin pie spice and pecans to the top before baking – so easy! Making this for the third year in a row! Best french toast recipe ever!! I have plans to make use of our leftovers with this! We have leftover homemade white poppy seed bread and a package of raisin bread. Then I’m going to scrape out the filling of a homemade pumpkin pie (from a pumpkin) that wasn’t eaten because it wasn’t sweet enough. I’ll add honey, cinnomon, sugar and enough extras to that mix to make it sweet and then add to the rest of the ingredients. I might try to add in some pumpkin coffee creamer in place of some of the milk. And plenty of maple syrup! Thanks! Now I know what to do with that sad pumpkin pie our aunt left at our house! My husband loves this breakfast. Luckily, this time of year I found pumpkin bread made by Pepperidge Farm. I mix that and some other grainy bread and its Delicious. Thanks for making me popular with my family! I made this dish for a brunch today. I bought one loaf of french bread, but should have used 1.5 loaves. I had to add 4 slices of white bread to soak up the rest of the egg mixture. The French toast was delicious! Only change I would make was maybe upping the amount of pumpkin butter or adding pumpkin purée. The pumpkin wasn’t quite as strong as I would have liked. Everyone absolutely loved it though! I made my own pumpkin butter just for this and it is now a thanksgiving traditional breakfast in my house and even the children love it. Thank you its so yummy and worth the extra calories! I have tried and LOVED Lee Drummond’s Recipe “The Pioneer Woman” for Baked French Toast and it is great! I was intrigued by the “Pumpkin” version. I am thinking the best way to make it less SOGGY and more French toast like is to consider adding in a tbsp. or two of flour. I eat gluten free so I subbed gluten free bread and used GF All purpose flour. Turns out like a dream everytime! With this great recipe idea I believe it is possible! I made this with pumpkin spice egg nog for the milk. I think it’s the best food I’ve ever eaten! Would this work with pumpkin bread? I would think so, but because pumpkin bread can be a little moist, it might get too soggy. But if you give it a try, let me know! I also used almost three time as much pumpkin pie spice and pumpkin purée. This made it a bit more soupy, but I was careful not to use 100% of the mixture, letting some go to waste, instead of pouring it all on the bread. I also baked for a bit longer…was also cooking bacon in the oven at the same time, so it was tricky opening and closing the oven frequently. This was a show stopper, many ppl loved it. Thank you! I made this for breakfast this morning for my husband and I and it was soooo good! I used an 8 1/2 x 8 1/2 pan since it’s just the two of us and cut the recipe in half. I still had to cook for about 45min but I think I had to much egg not enough bread but now I know for next time! I would definitely make this again. Yay! Thanks for sharing, Jessica! Oh no! Do they turn on and play without any prompting or hovering? We’ll look into that. Sorry, Beth! The biggest key to this recipe is the type of bread you use. If you skip the spices and pumpkin butter it will be bland. If you use regular bread it will be soggy. I went to the market and bought a loaf of homemade sour dough, something hearty and crusty like a rustic bread with raisin etc. is amazing in this dish and will soak up the batter. Can you veganize this recipe? I’ll add it to my list! Not sure at this moment without testing. This look great! Just wanted to let you know I’ve featured your recipe in a must make breakfast list on my blog, The Handmade Experiment. Check it out! Can I make this with gluten-free bread? Will it get too soggy? Not sure! Haven’t tried it. But it should work as long as it’s not soft bread to begin with. The heartier, day old the better. Hope that helps! This is a simple and delicious recipe that I will definitely make again! I halved the recipe, and it was the perfect amount to feed 2 people (with leftovers). I used Maple Pumpkin butter from Wegman’s and Challah bread from Trader Joe’s. The Challah bread worked perfectly to soak up all of the liquid overnight. I also added raisins and walnuts to the top, which went nicely with the pumpkin flavors. One recommendation I have is to leave a lid/tinfoil on your baking dish for the first 20 minutes – this helped to keep the casserole from drying out. I did bake for the 45 minutes, as I was worried that the bread was still too “wet” and wanted to make sure it was cooked through. Yay! Glad you enjoyed this, Elena. I’ll have to try the Challah bread from Trader’s. Love that store! I made this for a meeting this past weekend and it was AMAZING! I took the extra time to make your muesli bread (two loaves, delish) and the pumpkin butter. Homemade really made the difference here and it was very good. The pumpkin butter recipe yielded quite a bit so I shared a small jar with my sister-in-law:) The muesli bread base is adaptable for any kind of filling (dried fruit, nuts, etc). You really could put anything in there and it would still be amazing. Next time I might add some diced apples and cinnamon to the base recipe. Thank you for sharing!! So glad you all enjoyed it! Your modifications for next time sound perfect. Thanks for sharing, Anna! I made this today for brunch with my family. It was a hit and even my 2 picky boys LOVED it!! I forgot about the brown sugar on top but sprinkled it on after 30 min of baking. It tasted perfectly crunchy and delicious!! I did have to add about 15-20 min of baking time. Maybe because I used sandwich bread and it wasn’t quite done in the middle. I will be adding this to our family favorite recipes :). Thank you!! Yay! So glad to hear it, Michelle! Made this this morning for Christmas and it was very good! I used cinnamon bread (just regular stuff you buy in the bread isle), a little extra pumpkin butter but still didn’t taste very pumpkinny, dots of cream cheese and I made a streusel topping that I put on right before going in to the oven. I made it at 8:30 last night and pulled it out of the fridge at 8:15 this morning. Put tin foil on it for first half hour then uncovered for 15 more minutes. It was yummy! Will definitely make this again! Used a 9×13 pan, there were 4 adults and half a pan left. Glad it turned out so well for you, Cathy! And glad your family enjoyed it, too. Cheers and Happy New Year! This was amazing! I served this at Thanksgiving brunch and everyone loved it. I use brioche which I think would make a big difference in how this would come out. The bread being super fluffy, soaked up all the ingredients and came out perfect- soft in the middle and toasty in top. I did not use the pumpkin butter so I used more of the other ingredients like suggested. Topped it with sliced almonds and warm maple syrup. Made this dish for Thanksgiving breakfast. I used your basic 100% whole wheat sandwich bread, and pumpkin puree (adjusting spices, as suggested). Toasted pecans, and put them, along with brown sugar, on the top before baking. I like the flavor. Will do it again with a bit of tweaking to bring it around to just how I, and my family, like it. (Possibly adding some crumbled bacon – delish.) Thanks for the recipe. not a fan of this dish. I love pumpkin more than any other flavor and i felt like this was to eggy for me. I added extra pumpkin pie spice and all i could taste was the eggs! Will not be making this again.. I made this recipe yesterday for us to have for breakfast while watching the Thanksgiving Day parade – it was perfect. Thank you! I made this with challah bread for Thanksgiving breakfast and everyone loved it. I just made this for Thanksgiving and made a couple of substitutions. For the bread, I used Pepperidge Farms pumpkin bread, I used Kroger brand vanilla Carbmaster milk (60 calories per cup and 11 grams of protein), I used 3 whole eggs and the rest egg whites with a big spoonful of pumpkin pie filling since I forget the pumpkin butter. It was really good although I think I cooked it about 5 minutes too long-it was a little dry but some Torani’s pumpkin pie sauce fixed that! Thank you for this idea. I’m toying with a cranberry-orange version for Christmas. I read some of the other reviews as I was making this. I used a very dense 10 grain bread from the best bakery in the city…the kind you have to wait in line for at the farmer’s market outside in 25 degrees :) I used pumpkin butter that I made from allrecipes.com. I did soak it overnight, but drained some of the excess that did not get soaked up by the bread. I baked at 375 for 40 minutes. I also sprinkled brown sugar and pumpkin pie spice on top before baking. Next time I will increase the pumpkin butter and pumpkin pie spice. I will also cover the top with foil for the first 1/2 of baking and then remove for the last part to prevent the top from over browning. I may also try adding the cream cheese as someone suggested as a future variation. Can someone explain ((about)) how wet this should be before baking? The bread cubes were all moist this morning when taking it out of the fridge but there was no extra liquid, so I made added a little more. I followed the recipe but split it in half and used a smaller pan. How much liquid should you see before baking? Kel, you really shouldn’t see much. It should be mostly absorbed if you soak it overnight. Hope that helps! I’ve made this today for the first time, it was really good. I had to use pumpkin puree, and although I used more pumpkin spice and sugar, there was not much pumpkin flavor. Nex time maybe I will use more puree, or I’ll try to do my own pumpkin butter! I used Challah bread, and bake it for 45 minutes, and the texture was excellent. Here’s a little tip: if using nuts (I’ve used pecans) toast them in a pan really quick (they get burn very easily) and put them in the bread, then bake. It reaaaaaally enhances their flavor! I used Challah Bread last time and my family loved it. Making it again for company tomorrow. I used Challah bread too, and it was really good. Could you add apples to this? What would the ratio be? My daughter is allergic to eggs …any suggestions???? Tried it this morning but didn’t notice that I should have made it last night and then put it in the oven this morning. It was crunchy on top and soggy in the middle. My kids and I loved the smell but no one finished even eating what I put on their plate. Dissapointed for sure! Maybe I’ll try it once more but I’m not holding my breath. You HAVE to let bread pudding sit over night. Not really right to rate so low when you didn’t follow directions. Why are you giving it a low rating because you didn’t follow the directions? Is it possible to use pure pumpkin instead of pumpkin butter? I’ve used pumpkin puree, and although it was delicious, it didn’t have much pumpkin flavor! Holy wow! Made this for dinner last night, and it did not disappoint. I used Trader Joe’s pumpkin butter, as suggested and a loaf of their cibatta bread that I cubed and baked at 200 degrees for 15 mins to dry it out a little bit. I had to bake the dish closer to an hour to get the right consistency, but it was amazeballs. The kids wanted seconds, and I am enjoying leftovers this morning. I love that it was not too sweet, but more of a savory french toast that gets it’s sweetness from the syrup. Yum! HOW DO YOU MAKE THE PUMPKIN BUTTER? Becki, this is essentially the recipe I used. Hope that helps! Followed the directions perfectly… Used a Challah loaf that was 3 days old. And it turned out perfect! A total hit with my family! Thank you! OH MY, I tried it with apple butter too!!! Delicious both ways!! Mmmm great idea! I just bought some Cranberry Apple Butter from Trader Joes! I’m going to try it! Try using Challah Bread (egg bread) (Available in a few markets Artisan bread section at the bakery. I get mine at Giant Market) for the bread. Cube the bread and leave it sit out on a cookie sheet to get stale. 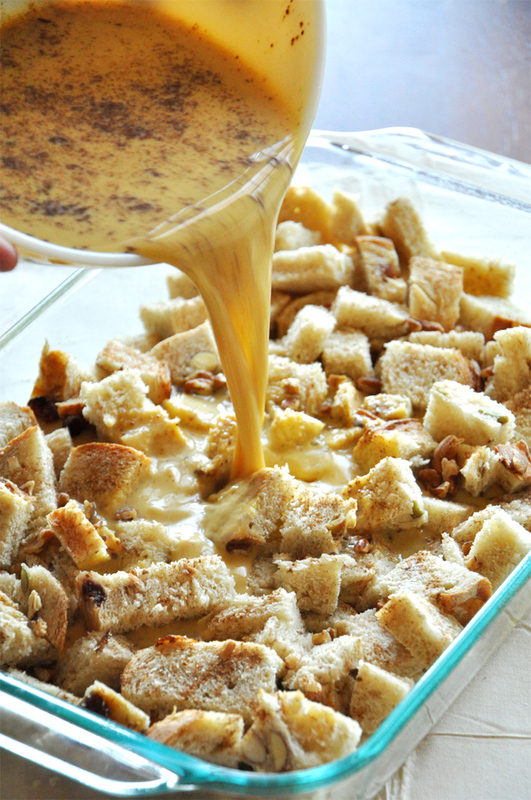 Stale bread soaks up all the good stuff and holds it! Also, try Half and Half in place of the milk. Half and Half has considerably less water content than milk and makes a creamier custard that doesn’t get as soupy in the mix. My kids hammer this stuff. Never any leftovers! Made this twice last fall and am getting ready to make it for company this weekend. Such a great recipe, thank you! I Loved this. I also added 4 oz of chopped cream cheese cubes to the bread mix and poured the pumpkin mix on top! So yummy! Hi- Wondering if this would work in a crockpot? Thank you. Kathryn, so sorry you had issues with this recipe! I’m actually planning on making a variation of it this month and will make any adjustments to the original recipe I see needed. It’s hard to tell exactly what went wrong with yours since so many other people have had success with it. Perhaps it was the kind of bread you used? Crusty bread on the stale side is best. Otherwise, I don’t know. Sorry again! I really hate hearing when people have trouble with a recipe. What is pumpkin pie spice? Can u find it in the grocery stores? Usually seasonal. You should be able to find it now. I was wondering the same thing and just googled it. I think Trader Joes is the main place. And I think if you don’t have a Trader Joes in your area you can buy on Amazon. Good Luck to you! Making this for fathers day gathering. Has anyone tried with Almond Milk? Or should I stick to regular? I chopped up the muffins and used half of the egg mix above and I put in cayenne pepper and tabasco instead of pumpkin spice. I poured it over and then topped with grated cheddar, powdered parmesan and a sprinkling of seasoning salt. Baked for a bit longer since the muffins were quite dense…turned out amazing!!! A huge improvement on the muffins and now I have breakfast for the week! Thanks for the inspiration. Made this for breakfast this morning and everyone thought it was great. I used winter squash puree because that is what I had and just increased the amount of pumpkin pie spice and added brown sugar like you suggested. Worked Great! Thanks for the recipe. This was horrible. It was like eating mushy bread. I even toasted mine and used a more stale bread. It was awful. I definitely don’t recommend it. It had a slight flavor like bread pudding but really nasty bread pudding like the kind you get at a truckstop. After reading through some of the comments, I was afraid to make this. I’m so glad that I stuck to my guns, because it was FANTASTIC! I served it for Easter brunch (8 hungry people and we had left overs!) and it received rave reviews from all. 1) I used dense, hearty whole grain artisan bread (one large loaf will do!) – and increased it to 5 cups because it seemed very soupy when I poured the egg mixture in. 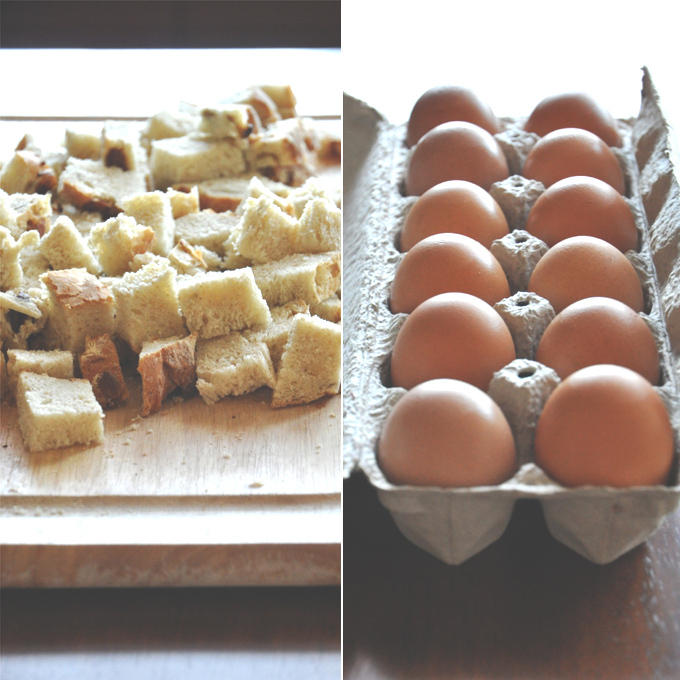 Make sure to push all the bread cubes into the egg mixture for a good even soak. 3) use Pumpkin BUTTER, people! I bought mine at Trader Joe’s – it makes a huge difference. A light drizzle of maple syrup was all it needed – the flavor was fantastic! Thanks for the great recipe – it is the perfect thing to make for a crowd, easy prep! Where is your recipe for simple pumpkin butter? I can’t seem to find it using the search bar. After reading through a page of comments I didn’t see where anyone tried making it with pumpkin bread. At Thanksgiving we make our stuffing with pumpkin bread, which is now requested every year. I’m going to try this recipe with pumpkin bread will let you know how it turns out. This recipie rocked! I saw it last night on Pinterest and immediately went to the store for supplies. I used cinnamon bread from our local bakery (Second Street Bakery), put it together and had it for breakfast this morning! What a hit. I put walnuts and brown sugar on top, had whipped cream and maple syrup, OMG. Next Sunday we will try it with carmel sauce and maybe some thin sliced apple on top. So many combos you could try. Thank you for the wonderful recipies and your blog, its great. I think I might bake the ginger cookies tonight and bring them to work. Great job. I made this for brunch today. So yummy! I think this has officially earned a spot on my “Make as Frequently as Possible!” list of recipes. I used French bread and pumpkin puree and it was perfect. Made this New Year’s weekend and it turned out great. Was more like a pumkin bread pudding! I used plain dried bakery bread crumbs, a one pound bag and the pumkin puree. Flavor, texture and moisture were great! Very easy and will make again. This is a wonderful hot breakfast that my whole family loves, and with two small children in the house, those are rare! I didn’t mind that the pumpkin flavor was light, as that makes it more likely that my kiddos will eat it. This morning I substituted a sweetened peach purée that I made this past summer for the pumpkin and left out the spice and it was wonderful! Can’t wait to try apple and raisin variations! This was a little too wet and not spicy or enough pumpkin for my taste. I just made it with more pumpkin butter and less liquid…EGGNOG instead of milk and some extra nutmeg and cinnamon! Can’t wait to try it. I made this for Christmas morning and it was a big hit! So yummy! I used a fruit bread. So good! I just tried this and the bread turned out a lot wetter than I thought. Maybe I didn’t use enough but the top was golden brown and I let it bake for the full amount of time. Am I missing something? It was still good I was just concerned about the wetness. I was a little nervous, given some of the comments. My husband does not like anything mushy (I don’t mind.. I love bread pudding). I don’t know exactly how much bread I used, but it was enough to fill about a single layer (maybe single and a half layer) in a 9×11 pan. Then I used only 4 eggs, 3/4 cup milk, 3/4 cup pumpkin, plus the spices. I added walnuts and sugar on top in the morning, but I think it would have been better with the walnuts mixed in overnight. Other than that, it was sublime! I used my favorite gluten-free cinnamon raisin bread (from Abigail’s Bakery in New Hampshire). That was a real risk because I love this bread and didn’t want it wasted. I probably used about 2/3 of that loaf. I would gladly try this with the full amount of liquid because I think it would be good a little mushy, but it was perfect just like this, cooked for the lower end of the time (I think I cooked it 33 minutes). If you don’t like pouring maple syrup on top, I might suggest mixing a little sugar in with the egg mixture. The brown sugar on top was just enough to give it a little sweetness, but some people might like more. Highly recommend using the Williams Sonoma pumpkin pecan butter. It’s a seasonal item so you will have to wait until next falls to buy it but it’s amazing on it’s own and was perfect in this recipe. Made this recipe for our brunch party for the Army Navy game and it was absolutely delicious and a huge hit!! Neither my husband nor I are huge fans of baked French toast because of it’s tendency to come out runny but this recipe had the perfect bread to custard ratio for us and came out moist and dense but not runny. I used a 1/4 a cup of the Williams Sonoma pumpkin pecan butter in place of the pumpkin butter and cut up the two pack of French baguettes from Costco for the bread. I also added dried cranberries which I thought would be a good addition since the original recipe she tried used raisin bread. Please add this recipe to your holiday must make list! You will love it and it’s a versatile enough recipe to try different breads and add ins. Thank you for this recipe. Go Navy! Can’t wait to try this on Christmas morning. I made this to take to church for breakfast! I used Texas toast bread 5 cups, some Cinnamon, extra pumpkin spice and raisins. I let it soak and set over night like 9 hours or more. It was a big hit and I will be making it again. Several asked for the recipe! Love the blog!! :-) New fan right here! haha, love this mentality! brunch is about as good as it gets in my opinion. Enjoy, Jane! This was so easy and delicious! I used a combination of white bread and dark whole wheat bread (bc that’s what I had) for the cubes, and I had to use more like 6 cups of cubes. The bread was fresh and moist already so I used a lot of cubes since I read all the comments saying it was soggy. It came out perfectly using that much bread. Flavor was good, not too pumpkiny, just enough and just enough spice to it. It’s a keeper! I made this for my family for Thanksgiving morning, and it was delicious! Everyone raved about it. I used a crusty, rustic loaf of Italian bread from the grocery store bakery, and it worked perfectly. I used 1/3 cup pumpkin butter, but next time I may add even more pumpkin butter and pumpkin pie spice – it was delicious as it was, but we’re big pumpkin fans, so I’ll add more next time. This recipe is definitely a keeper! I made this for my family and in-laws. Everybody loved it. Wonderful Thanksgiving morning recipe – THANK YOU! I prepared it at about 9:30PM the night before. I used Pumpkin Butter as recommended and Wheat Bread (found in the bakery section of the grocery vs. sandwich bread [i.e. Wonder bread]. I cooked it for about 50 minutes and it turned out golden brown and it was terrific! My family enjoyed – especially our toddler. Thanks for posting this. We enjoyed it and I may pull it out from our box of tricks for Christmas morning too. PS – Pumpkin Butter can be found at Fresh Market, Whole Foods, or Wegman’s (for readers/cooks) who live on the East coast. Highly recommended (small jar would be sufficient as only 1/4 cup is needed). She neglects to say in the prep time that it takes an additional 12 hours in the refrigerator, which is part of the prep time. So don’t try and make it just in the morning. Corey, thanks for noting that! I didn’t include it in the prep time originally because it isn’t technically hands-on prep time. However, I’ve amended that and the recipe now reflects that. Thanks! Thanks for sharing Dana!! I am excited to share this on my blog tomorrow, Nov 16th as one of “My Friday fave Pins”. I hope you will come by for a visit!! Thanks for sharing such a fabulous recipe!! I also make mine with canned pumpkin. I use a whole can and more bread than it calls for. This is my fifth year making this for Christmas breakfast. Everyone absolutely loves it! Even a few who normally don’t like pumpkin. It’s definitely a hit at our house every year. 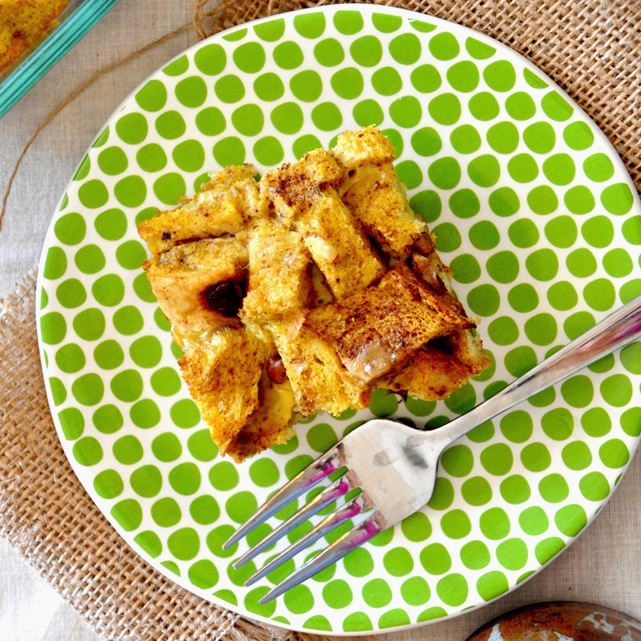 What do you think about an Apple French Toast Bake? I only ask b/c at the moment I don’t have pumpkin butter at home, but I do have apple butter and apple pie spice…Think I should give it a shot? This sounds amazing! Totally give it a shot. As you might see in the comments some people have had to play with the texture/flavor depending on their ingredients, so tweak it as you go. I highly recommend a crusty bread over sandwich bread as it yields a much better texture. Hot cinnamon syrup over the top of this would be great! Hope it turns out, Lauren! I can’t wait to try this! Definitely making it for brunch on Sunday. ugh it is in the photos but not the recipe! I didnt add it in! Is it just me… I cant find where you used pumpkin pie spice! I bought some at Penzeys Spices in AZ but not in every state. Specialty or upscale grocers as well as shops that specialize in cooking utensils and accessories. If not, you can google and order online I’m sure. Mine has cinnamon, vanilla sugar, mace, ginger, nutmeg, anise seed and clove all in one bottle. Lol! I’m answering a post from 2012 but it still can help in the year 2016! Happy a Festive October to all you great bakers and creative cooks!!! Can you do this as a freezer meal too? butter to maple syrup and heated it up….. Yes! It goes in with the egg batter. Where did you get those adorable plates?? So cute!!!! I got them at a local grocery store! I just made this today. I used 1 loaf of cinnamon bread from our local bread shop and 5 eggs and 1 1/4 cup of milk and 1/2 a can of pumpkin puree and followed the rest of the recipe. Soaked it over night and baked it at 350 for about 35 -40 mins. It did not turn out soggy and it smells good and I am waiting for my kids to get up and eat it. I thought it was good! Where does one find pumpkin butter? trader joe’s, health food stores, some grocery stores. ALso, I’ve shared the link to the recipe I used in the above comments so you can make it from scratch – it’s pretty simple. Hope that helps! Sounds yummy! I love your plates — where did you get them? Thank you. I scrolled all through but must have missed it. It would be nice if there was a link in this recipe to the Pumpkin butter recipe….or if it ws searchable on your site. YUM! I just made this and it’s so good! I used the same ingredients but used a cinnamon raison bread which gave more flavor. I also added 4 tbsp of brown sugar. I will definitely be making this again. This was GREAT! I made homemade whole wheat cinnamon bread and used the whole loaf. I used homemade pumpkin puree 1/2 cup, added some real maple syrup to the egg mixture, I also added a whole apple diced small. I did not put brown sugar on the top, just sprinkled cinnamon lightly with a little sugar in it. I refrigerated it over night. This morning, I mixed it up again to bring some of the egg to the top. It took 50 minutes to cook (not 40). ALL three of my kids had seconds AND we have breakfast for tomorrow too! Elly, so great to hear! Thanks for sharing!! What is “pumpkin butter”?? I have searched this recipe & your site with no luck.. I am waiting for that answer too Mindy! Dana, that link goes to pumpkin frappucinno, not pumpkin butter. Mine is in the fridge now. I will bake in the AM. I am pretty excited. What I suggest is using enough bread to lightly fill it, even so that it looks like it is piled up a little bit. Then about 3 hours after refridgerating, go back and check to see how wet it looks and use your best judgement. I added 3-4 slices of bread just now. Also, in the AM before baking I am going to toss the bread pieces with my hands a little so that all the egg isn’t settled at the bottom, if that makes sense. I am anxious to try, but I cook down my own pumpkin & freeze it that way I have real/fresh pumpkin all year round. I thought that one could make an apple one with apple sauce & apple pie spice. The sky’s the limit on variations. The apple idea is brilliant! :) I had to look up apple pie spice. I had never heard of it before, but allrecipes.com has it and looks easy. I make caramel apple one all the time just using caramel coffee creamer instead of milk and adding sliced apples. Think this looks delicious. I made a pumpkin one with the pumpkin spice creamer too. The pictures from this are just so lovely, makes me hungry. Whats the best type of bread to use? Jaimie, a crusty, rustic bread works best. I used my 7-ingredient muesli which was crisp on the outside and soft on the inside. It was about 4 days old when I used it, which also helps soak up the batter. I haven’t personally tried it with sandwich bread but it apparently yields a different result. Hope that helps! I have this in the oven now. Some people said it should have pumpkin pie spice? I didn’t see that. How much? I made this but I used 1 c or more of Libby’s pumpkin pie mix added more spices and a bit more bread all I had was hawaiian rolls and dried out ciabatta bread. WOW was it good. I was out of pumpkin butter. Hello!!! I started this recipe and as always I didn’t read the part about soaking overnight so I have let it sit for about 45 mins bc we are starving. I will let u know the outcome! I also added cinnamon and a tad bit pumpkin spice bc I do not have the pumpkin butter I just used regular butter. I am going for more of a regular French toast…I hope it works!!! I made this recipe exactly as written, buying pumpkin butter just for the occasion, and it turned out OK. I did not have the problem of several others of it being overly soupy but I did find that the inside was still very mushy even when the outside was crusty and brown. My biggest problem with it however was just how bland it was. Without maple syrup it really wasn’t much good at all, you could barely even taste the pumpkin! Maybe if you used cinnamon bread it would be better but as it was I think I would have been better off just making some good toast. Disappointed. I made this for breakfast, and the whole family loved it. I saw some people said it didn’t have pumpkin flavor when made with puree. The things about pumpkin butter is that it is slightly sweet where puree has no sweetness to it. The only thing I did different was add 2tbsp. sugar, and that made the pumpkin flavor come out more. Also, I would not use basic sliced bread because I have learned it never sets well. I think next time I am going to try a little molasses, to give it that fall flavor. Also, I need to make 2 pans if we have company because my hollow-legged sons almost polished the whole pan off! I made this last night to pop in the oven this morning and it delicious! I used a loaf whole wheat Ciabatta and I did take an extra step and make my own pumpkin butter. I followed your recipe exactly, and added about 2tbsp brown sugar and a handful of roughly chopped pecans before popping it in the oven this morning. So easy to put together and the family is rubbing their belly – thanks for sharing! Great to hear, Heather! Thanks for sharing! 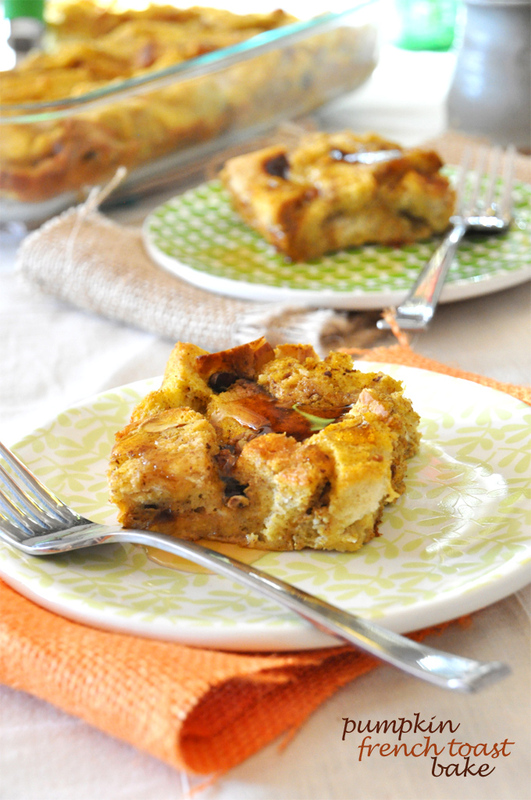 We call this bread pudding where I am from, and it sounds lovely in this version. My ratios are near the same as yours, tho I always use at least 5 cups of bread. Here I think others may be getting a more soggy result due to using a less dense bread than your muesli bread. When I’m out of my homemade bread and can’t get at a hearty type of whole wheat bakery loaf, using the groceryshelf white or even whole wheat loaf absolutely makes for a soggier result. In that case I’d say use 1/2 cup less milk and see if there is an improvement. Also I always cover my bread pudding with tinfoil for the first 2/3s of the baking, and uncover for the last bit of time. This way if a longer baking time is needed to set the custard well I can do it without burning the top. Is pumkin butter sold off the shelves as is, or is there a recipe on the site for it? I am not familiar with this ingredient. Can’t wait to try. It’s in the oven as I write this. One thing I was confused about with the recipe though. The 1 1/2 tsp pumpkin pie spice that is listed in the ingredients is not included in the instructions “whisk together egg, milk, vanilla and pumpkin butter”. Do you only add it if you are not using pumpkin butter? Or was it left out of the instructions on accident? For those whose bread was to soggy, I suugest toasting the bread cubes for. 10 minutes then let them cool before pouring the mixture and soaking overnight. Toasted bread can absord more liquid and it cooks up more firmly. I also used less egg, less milk, more puree, nutmeg and cinnamon and brown sugar since I did not have pumpkin butter. My office loved it. Just put this in the fridge… It seemed to need more break, closer to 4.5 cups, but you addressed that issue earlier. I am trying a homemade cinnamon bread loaf and pumpkin puree – no pumpkin butter. I can’t wait til morning! I have a recipe where you spread the pumpkin puree out on 3 layers of paper toweling on a cookie sheet. That pulls lots of water out. I actually spread the puree on the paper towels and then put 3 more layers of paper towels on top. When the bottom layer is saturated, I flip it over and saturate the other 3 layers of towels. Then the puree just flips off the towels very easily. It doesn’t seem like it will, but it does. Just fold it over it’s self a few times and flip it into a bowl. This removes lots of liquid very quickly. Where do you get pumpkin butter??? Trader Joe’s carries it. Or you can make your own with pumpkin puree and some sugar. I got mine at Walmart. Country crock Brand had some. Are you sure you were using actual Pumpkin Butter and not pumpkin spice margarine? I’ve never see actual Pumpkin Butter made by Country Crock. I don’t see how 3 1/2 cup bread cubes covers a 9×13 and soaks up 7 eggs and 2 cups of milk. The recipe I’m seeing must be updated or something because I’m reading to use 5 1/2 – 7 1/2 cups of bread. Mine turned out nicely! I just made this today and loved it. I used the pumpkin butter 1/2 cup and it had great flavor. I let it sit overnight and it was not soggy. Nice and golden brown on top. This was a test and I will make it for the holidays for overnight guests. Yum! i had to use more bread than suggested as the amount suggested was just floating in 9×12 pan… also had issues with it too runny in middle & too dry/crunchy on top…. maybe a lower temp, longer bake time? am cooking longer & hoping for the best… smells awesome! I also let it soak for 10 hours… maybe too long? final verdict, 5 stars… just needs the following adjustments: 4 1/2 – 5 cups bread & bake for 60 min, and let rest for extra 15min just right, i thought it was getting to crunchy on the outside, but it turned out fine! so delicious! all the recipes i have for any french toast bake is 1 hour. I do a half hour… its only to soak up the egg from the button, and i mix or fold it before baking to ensure the most soaked eggie pieces are on top for better baking. Beware though, this is not supposed to be totally dry bread when it comes out. No, I would say you can soak it for 6-8 hours and it should be fine. Overnight is ideal though. You DO have to refridgerate it while soaking, whether it’s overnight or not. Ok so I just made this and did not have pumpkin butter but I looked up what was in it and added that to the mix. I let it refrigerate for about 7 hours and baked it for 45 minutes it turned out good next time I will add more pumpkin. The top is crispy and the inside is fluffy like soufflé, moist but not runny. Will make again but I will get pumpkin butter first. Lovely, thanks for sharing, Larisa! I can’t wait to try this. I think I want to make it for Thanksgiving morning when we watch the parade. Maybe a new tradition if all goes well. Thanks for sharing! I think if you increased the pumpkin puree, then those that are complaining they cannot taste the pumpkin will like it more. I use 1/4 cup of pumpkin puree per serving in my french toast. It isn’t a casserole, but the flavor is definitely present. Perhaps reducing some of the liquid and increasing the puree? I’m going to make this…love French toast. Full disappointed with this recipe. Made it as the recipe suggested. I didnt have pumpkin spice so I used a tad extra pumpkin puree, I also used cinnamon to add some extra flavor. I cooked it for the full 45 minutes and it was still wet feeling. On top of being mushy and wet there was hardly any flavor. This recipe was sooo easy to make and smelled incredible, so I am disappointed that it did not turn out as expected. Also, I couldnt have cooked it any longer because the top was getting dried out and brown. Hope this turns out better for you! If you don’t have pumpkin spice try using this (makes more than you need by just a tad): 1/2 tsp ground ginger, 1/4 tsp ground allspice, 1/2 tsp ground nutmeg, and 1& 1/2 tsp ground cinnamon. So yes if you just used cinnamon you were missing out. Pumpkin like a lot of other squashes is kinda like a blank canvas – they carry flavors you add to them very well. I’m wondering the same…..about the pumpkin butter…..what is it and where do we get it??? Candace, I made my pumpkin butter (which you can find the recipe to in this post – https://minimalistbaker.com/5-ingredient-pumpkin-frappuccino/ ) But you can also get it at Trader Joe’s and a few other grocery stores. However, I recommend making it as it’s very simple to do. Hope that helps! I didn’t see the link for it anywhere, maybe, I overlooked it. Hi! I got my pumpkin butter from the fresh market. Making it right now, hope its good!! People forget that we all use different types of bread. My bread is homemade or from Great Harvest which are very dense breads. So mine would come out much more dry then someone that just bought wonderbread from the grocery store which is mostly air and chemicals. Whenever I make these type of bread casseroles, you have to make a lot to start to recognize what the dish needs to look like before you bake it. How do you make pumpkin butter at home? There are different variations YOu could bake. Mostly we like the one where we use cinnamon bread, and a strudel topping. Email me if you need further instructions and help, as this is a very excellent recipe! Maybe you should try one more time! Are you kidding me??? You shouldn’t give anyone a bad review if you don’t follow instructions to a “T”! Where you didn’t have to have a dry ingredient, you added a wet then complin it’s mushy, oml. This looks great. I wonder if it can be frozen to bake later? I am in a swap group and with the holidays coming, the members are thinking that it would be nice to offer trades that would compliment the Thanksgiving cooking chores. I can see this being a great way to make Thanksgiving morning breakfast or even next morning breakfast easier for anyone hosting out of town family over the weekend. And for me, this would be a great way to incorporate my back yard eggs into the swap. Thanks. Bread can freeze and be very convenient. You can prepare and bake this recipe as said. And after baking(because of the egg) freeze slices of your finished product to keep for up to 3 months depending on the packaging you use. I would suggest always using a thick plastic style bag and making sure all air is out and tightly closed. (I prefer to double bag… making my life of food a little longer lasting)…. You can freeze in containers but I do not suggest it beings you can not get air out of packaging. Yes, made several with the cream cheese. We did them for my daughter’s graduation party brunch. They were a big hit! Have also added bananas and cream cheese. This Pumpkin one sound delicious. I had originally found the recipe in a cookbook from a lodge in northern MN. Naniboujou Lodge, They serve it at their sunday brunch. What a mouth watering pumpkin french toast. Definitely on my list to make! Oh I make something like this, not with a Pumpkin taste. Mine is just plain but with cream cheese. I make it in a deeper pan so it puffs up more and makes more like a bread. Then slice it like a bread. If I am lucky and there is any left (a rarity). I freeze it so it’s a quick breakfast on the go in the mornings when I don’t have time to do wait for the normal bake time. I can’t wait to make this one, I know my family will be happy that I have another french toast bake to make it sounds so yummy! Can you link me to your recipe using the cream cheese or tell me how you incorporate it into this type of recipe. I don’t have a recipe per-say, I just make it. When I am putting the dry bread into the pan I have cream cheese that has been cut up into small cubes. The cubes are basically are the size of a butter pat quartered. I sprinkle them within as I add the bread in. Some times adding some same size pats of butter as well. These melt together when cooking so you get a small little bursts of the cream cheese. I hope this explains it. I usually make a lot at once since it never lasts long here. It’s the only way I can make some to freeze. Sorry to take so long to get back to you. Hope this explains it. Oh my gosh – most perfect breakfast ever! Can’t wait to try it. 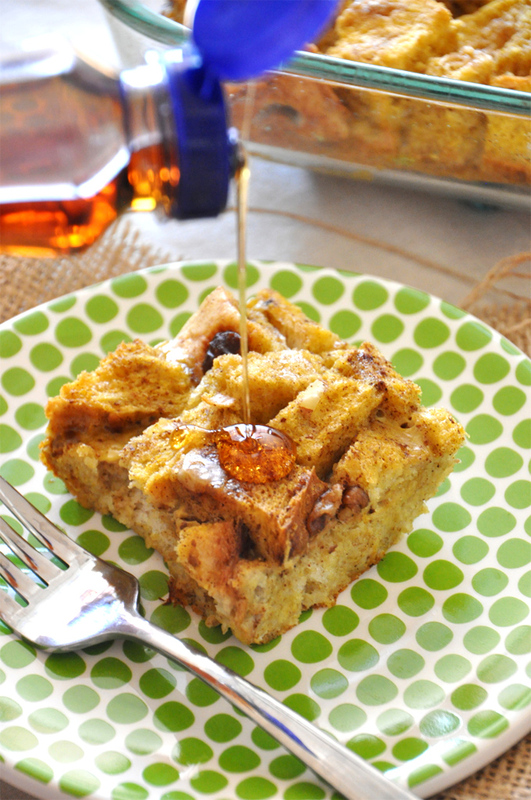 Wow, this French toast bake is sinful! Found it through most favorited photos on FoodGawker. This looks absolutely amazing. I can’t imagine what would be a better breakfast on Thanksgiving morning. Pinned this one to try. Can’t wait! what a beautiful breakfast. it looks delicious! Hello beautiful breakfast! I now knwo what to do with all the bread I have. This looks so good! I love anything pumpkin!! Ha ha! Yes, breakfast of champions!! I’m drooling!! Totally trying this one soon!